When was the last time you saw one of these big inflatables outside of a dealership? That is, until it comes to email marketing. Think about the last five email messages you sent to your customer database. Were they promoting a sale you’re having? Advertising the latest offers and incentives? Maybe offering some service coupons? All good messages, but what if your customer isn’t in the market right now for a new or used car? And just had their vehicle serviced? Your email is about as helpful as a giant gorilla. What happens next? Click. Your email was just deleted – or even worse – the customer hit the unsubscribe button. In 2018, email marketing still delivers one of the highest returns for your marketing dollar but you can’t continuously use outdated “Buy Now! Buy Now!” messages. Newsletter articles like this build rapport with your customers and keep them coming back to your dealership. It’s as simple as that. Put yourself in your customer’s shoes. 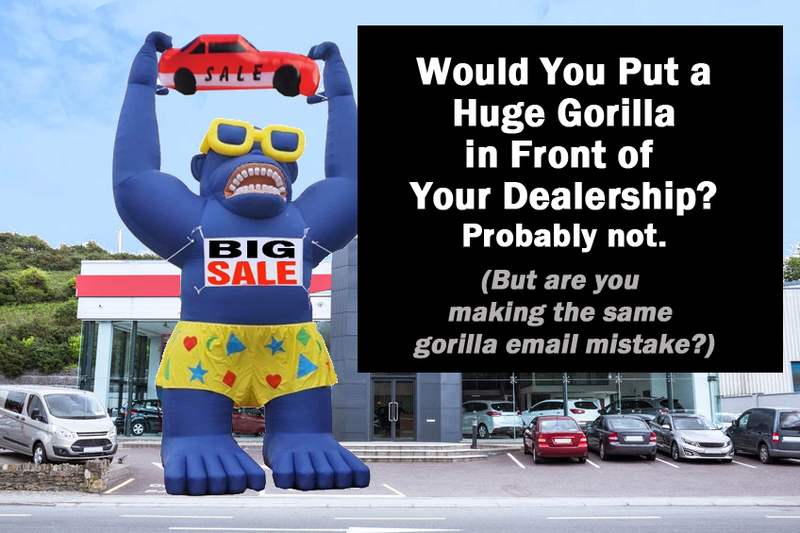 What kind of email messages from a car dealership would you want to receive? The automotive newsletters that we produce for car dealerships throughout the United States and Canada, deliver consistently high open rates and click throughs with very little effort from you – we’ll take care of everything. Give us a call at (800) 879-8870 for details on our free trial. This entry was posted in Automotive Newsletters and tagged car dealership newsletter. Bookmark the permalink.